Baby-mania. Sometimes it seems to be everywhere we look in today's society. The media obsesses over celebrities' pregnancies and newborns - and forever speculates about phantom "baby bumps" on those female celebs who haven't yet announced a pregnancy or given birth. Go on Facebook and you will get deluged by birth announcements, baby and child photos...often with people substituting their children's images for their own to represent them in avatars. Do people stop having any identity beyond being parents once they've given birth? Politicians and the church stress the importance of "family" and "family values", yet only seem to count those with children as being part of that magical "family" equation. "Do you have children?" is quite often the first question any women gets asked when meeting new neighbors, co-workers, or simply engaging in any social activity. These situations all illustrate the concept of pronatalism: that child-bearing and parenting is always to be encouraged, promoted and desired as necessary for society and beneficial to every individual's health and well-being. Is this simply a natural - or even instinctual - state of existence, and the way things should always be? Or is it time to perhaps look at and question our apparent cultural valuation of parenthood and making more babies above all other accomplishments and goals in life? In The Baby Matrix, author Laura Carrol says she wants her book to be a "manifesto" for a new, post-pronatalist world. She believes enough is enough: that we need to make room for those who either choose not to become parents or perhaps are childless by circumstance, infertility or remain undecided about whether becoming parents is right for them. That it's time for us all to re-evaluate and question whether the so-called drive to become a parent is really biological or driven instead by outdated societal pressure, and whether that parenting imperative is actually harmful and not helpful for today's modern world. It's a bold statement to make, and does The Baby Matrix really meet its promise of providing a strong "manifesto" for an alternative view on our lives? After reading the book I find myself of mixed feelings on the matter. While I believe the book may be a good read for those who have not questioned or truly examined our cultural tendencies toward natalism, I'm not sure it provides deeper answers or information for those who are already deeply aware of these issues in their own day to day lives. Do you believe we live in a pro-natalist society? Yes and I see nothing wrong with that. Nothing is more important in life than having children and being a parent. Yes and I think it's time for a change. Not everyone should feel pressured to reproduce if it is not the right choice for their life or impossible due to health or circumstance. No. I think there are far more challenges and prejudices out there for those who are parents. I don't know/Don't have an opinion. This book has been on my to-read list for some time, and I came into it with high expectations based on its description and reviews from others. I am a woman affected by infertility, who has chosen at this time (due to reasons including but not limited to my age, the expenses involved, and high uncertainty of success) not to pursue alternative family building options such as fertility treatments or adoption. It has not been an easy decision to make, nor has been easy to deal with the pressure and judgement from others on my decision. As a result of my situation I have become acutely aware of the biases in how parents versus the childless/childfree are treated, regarded, and accepted in their communities, workplaces, and even by their closest family members. So I came in to this book hoping to find a text that would not just echo the things I already had experienced and knew, but would perhaps give me additional strength - and further ammunition - in dealing with our pronatalist world. Perhaps that was a bit of my problem from the start; I did not need convincing that our world operates with a pronatalist bias; I wanted more in-depth discussion of why this is the case, and how we can actively go about changing things and bringing acceptance. In the opening chapter of The Baby Matrix, Carroll gives a very brief overview of why encouraging high-birth rates was so important in the past and why natalism was encouraged or valued through the evolution of society: disease and high mortality rates meant lots of children needed to be born to keep cities and indeed empires thriving; religions needed to encourage family growth in order to gain more followers; settlers in the New World needed to have many children in order to help with farm labor. Big business, too, likes to see lots of babies being born as that means more consumer goods to be purchased in the future. This is no great surprise or revelation - nor anything that can't already be found on a basic wikipedia page about natalism. Carroll mentions how pronatalist messages dominate our entertainment media, which is also true, but she gives very few specific examples which would help make the case, especially for those readers who might not be specifically aware of it and the insidiousness of this message. The Baby Matrix then presents a chapter each dedicated to seven "assumptions" made in our pronatalist society and how they affect our lives and expectations. Carroll suggest an "alternative assumption" for each which is supposed to be the post-pronatalist worldview to be encouraged. For instance, there is "The Fulfillment Assumption": the widespread belief that "The ultimate path to fulfillment in life is parenthood" and that those who do not become parents will never lead a truly full and satisfying life. The author's alternative is to suggest instead that "Parenthood is one path to purpose and fulfilment in life", but not the only one and not the right one for all individuals. This is actually one of the strongest chapters in the book, in my opinion, as she discusses how many jump into parenthood assuming it will fill a void in their lives, but then discover that it is not a magic pill for happiness and satisfaction; indeed, many will admit later in life that if given a choice to go back in time, they would have chosen not to have children after all. Other chapters tackle assumptions and myths such as "The Elderhood Assumption", that we need to have children in order to be happy and well-cared for in our old age. The author does a good job in this chapter of exposing the myths behind this assumption, especially in the modern day when we cannot assume children will live near us when we are older, want to or even be capable of providing full time care for their parents. She is spot on that we need to each make it our responsibility to plan for our elderhood support structure, housing and health care whether or not we have offspring. I did have some problems with Chapter 5 in this book, focusing on "The Right to Reproduce Assumption". The author begins talking of how parenthood should be treated as a "Privileged right, not an automatic right" - a statement that is sure to anger, shock and turn off quite a few readers whether they are parents or not. Yes, it is true that many people have children they are not emotionally, mentally or financially able to take care of properly. But when women have had to fight so long, and so hard, and are still fighting to have the right to terminate unwanted pregnancies and have access to birth control methods, should we be encouraging the other extreme of, as Carroll would suggest, "licensing" people for parenthood, before allowing them to give birth/keep a child? Should we be financially penalizing those who have more than one child, and even forcibly sterilize those who have committed abuse or been deemed unfit parents? I find those ideas too radical and extreme, and frankly rather terrifying. Has Carroll not examined the horrible results of China's "one child" policy, and how that has lead to rampant female infanticide, imprisonment of women who refuse to comply, and other horrors such as were exposed in the 1995 documentary The Dying Rooms? Perhaps instead of regulating parenthood, we should be focusing on improving the laws and systems in place to make adoption easier and a more available alternative once again, improving education and access to birth control for young men and women, and better counseling and support to those parents (and children) under stress and in need of help. The book's final chapters look at how we can move toward a more "post-pronatalist" world, including how to answer questions and deal with awkward situations that can arise when one is childless and childfree. While I did appreciate her suggestions for dealing with nosy relatives and friends, I'm not interested in being just as nosy and meddlesome as she suggests, turning the questions around on others as to why they have children, why they didn't adopt, why they choose to contribute to "overpopulation", etc. I rather wish we'd all learn to just accept and not judge each other based on our reproductive choices and situations in life. To me, that is what a truly "post-pronatalist" world would look like. In this earlier title by the author of "The Baby Matrix", Carroll interviews a variety of couples who have made the choice to live without children. I recommend this book for those trying to decide on whether parenthood is right for them, and also for those who may be struggling with finding fulfillment in their lives if kids aren't in the picture. 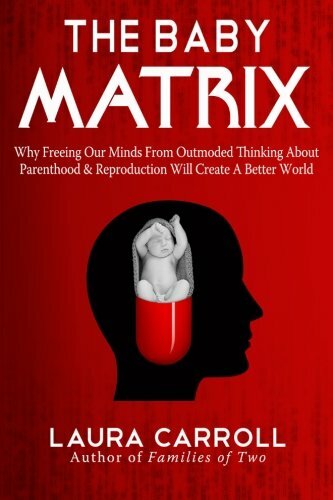 Despite my criticisms, I still feel that The Baby Matrix is worth a read, perhaps especially for younger women and men who may just be starting to think about their future paths. It may help them understand that there is an alternative for their future lives that does not have to automatically include having offspring. It's not a bad starting point for those beginning to question society's pronatalist biases and assumptions, but I feel that it's just that: a starting point. There are quite a few other books, websites, and communities that explore these issues and questions in greater depth, so the book may not make for much of an eye-opening read for those who have already decided to embrace an alternative path without children in their lives. 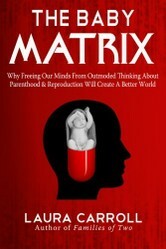 Have you read The Baby Matrix - and what did you think of it? Or is it a title you think you might find interesting to read now? Feel free to leave your comments below.